TOKAI OPTICAL CO.,LTD. : Product : What are absorption glasses? HOME >> Product >> What are absorption glasses? absorption glasses have special color filter lenses that effectively cut out short-wavelength light (ultraviolet radiation and blue light rays) of 500 nm (nanometers) or below, which cause glare, and let other forms of light pass through as much as possible. The white haze that seems to appear due to glare is cleared up by eliminating short wavelengths and contrast is enhanced. This does not necessarily apply to some as the effects vary according to differences among individuals. Wavelength light of 500 nm or below, which causes the inability to distinguish between glare and contrast, is light rays with high scattering rates and high levels of energy. Blue light of short wavelengths make the sky look blue by colliding with nitrogen and oxygen molecules in the atmosphere and scattering first. This blue light that scatters easily causes glare and flickering, and makes the contours of images fuzzy. In other words, it is the lowering of contrast. absorption glasses increase contrast by cutting out only this scattered blue light. They also sustain bright and clear vision by letting plenty of light in colors such as yellow and green, which appear bright, pass through. They are especially effective for those with poor vision due to glare caused by early cataract, cataract surgery, retinitis pigmentosa, age-related macular degeneration, tunnel vision caused by glaucoma, and other optic nerve diseases. absorption glasses also increase contrast for those with healthy eyes with their anti-glare effects when they experience glare outdoors. The glare from the headlights of oncoming cars can also be reduced when driving at night, depending on the color. 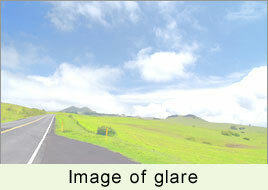 absorption glasses are effective for anyone who experiences glare. 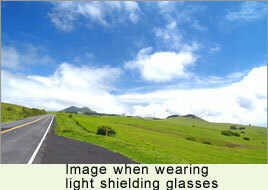 Normally, short wavelengths are cut out to some degree and glare is reduced with lenses when light enters eyes. Glare may still remain even if intraocular lenses are implanted and sight is improved through cataract surgery. absorption glasses cut out short-wavelength light that enters the eyes and reduce glare. 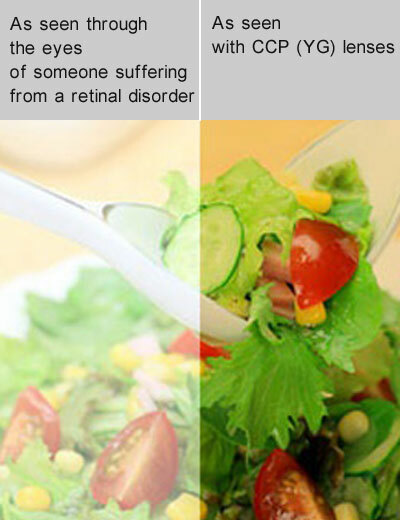 absorption glasses were created to relieve glare for those with retinitis pigmentosa. They are currently available as products for not only those with retinitis pigmentosa, but for anyone who experiences glare. Many sunglasses are designed with emphasis on fashionability so such design can sometimes be detrimental to good vision. They may let glare pass through in bright places and make visibility poor in shady places. Can absorption glasses be used as sunglasses? Products in the CCP and CCP400 series are widely used for medical purposes and as high-performance sunglasses for driving and outdoor activities such as golf and tennis because they suppress glare and enhance contrast. Blue light rays are said to be one of the causes behind glare. There are some products that are not suitable for driving in the daytime due to coloring or not suitable for driving at night or at dim places because of the risk of misidentifying signals due to functions that suppress blue light rays. It is suggested that you try out a sample to see how it really is when selecting a color for absorption glasses. People react to them differently so please select one to suit the situation you plan to use it in. It is recommended that you try a sample on a day when the weather is good. Please note that there are some absorption lenses that are not suitable for driving in the daytime due to coloring or not suitable for driving at night or at dim places because of the risk of misidentifying signals due to functions that suppress blue light rays. They are not suitable for driving in the daytime because of the attenuation properties of particular wavelengths and the risk of misidentifying signals. Lenses with below 75% in luminous transmittance are not suitable for driving at night or at dim places because of the risk of decreased vision under such circumstances.